The premise of CBT has been stated as “you feel the way you think.” In actuality, feelings, thoughts, and behavior arise together and are interconnected and interdependent. When we change thinking (cognition) or behavior, it has a direct impact on our feelings, and we can use thinking and behavioral tools to regulate emotion in a healthy way, enabling us to maintain a greater sense of well being and communicate more effectively with others, while staying connected to our feeling life. Of course there are also unhealthy and destructive ways to try to regulate emotion and feel better – such as the overuse of suppression and distraction, various forms of addiction, psychological defenses like denial and rationalizing. CBT points us in the right direction. Examples of behavioral strategies that calm us so we can respond more fully and effectively, include deep belly breathing, and progressive muscle relaxation. These techniques, which can be learned and practiced, activate parts of the nervous system that directly counter stress reactions. When we are too stressed we are limited in our ability to respond well and may behave impulsively in destructively ways. When we act from a calmer and clearer place, we can mobilize all of our resources in the service of self-care and self-assertion. Behavioral tools are particularly effective when a person is “flooded” with emotion, and is having difficulty focusing or thinking clearly. Clarifying and being aware of a range of healthy behavioral options for self-care, along with an ability to enact them is usually a worthwhile goal of psychotherapy. Thinking clearly and maintaining perspective is essential for adaptively responding to life situations. Conditioned belief systems, even ones that worked well at one time, can lead to “automatic” reactions that no longer serve us. For example, if someone learned growing up in a dysfunctional family, that it was unsafe to depend on others, then that could play out in adult life as a “counter dependent” character trait, a fear of and resistance to depending on others. While that might encourage a person to develop more autonomy as a strength, the unwillingness and inability to depend on others as needed, limits intimacy and creates unnecessary suffering. It is “normal” and enriching for adults to at times depend on and seek nurturing from other adults who, unlike the family of origin experience, actually can provide support. 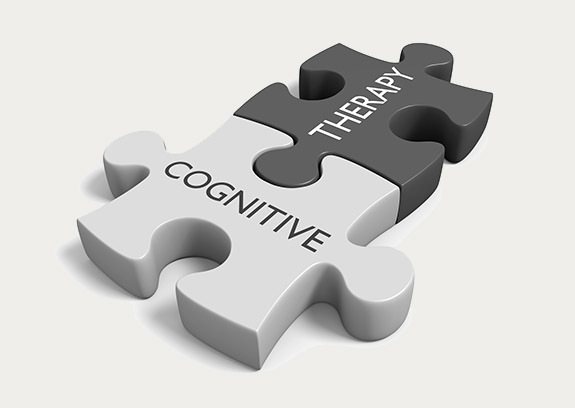 Cognitive Behavioral Therapy encourages awareness of underlying thoughts and beliefs – like “I can’t depend on anyone” – and fosters a productive questioning of the belief that allows a retesting of reality to see who in fact can and can’t be depended upon. With an increased ability to clearly discern the current situation, we have many more options and can feel empowered. Perhaps the most painful beliefs have to do with self-image – some form of “i’m no good,” or “I’m not good enough” – accompanied by feelings of inadequacy, shame, guilt, resentments, anger at the self or others, and other painful feelings. These are core wounds that cause great distress and effect all levels of functioning. Psychotherapy, using tools like CBT, strives to address core identity and self-esteem issues in a deep way that leads to transformation. Seeing oneself as a whole human being, with strengths and weaknesses, yet still worthy, loving and lovable, is transforming. Accepting oneself, while still seeking growth, is transforming. One form of CBT encourages “self-talk” that tries to catch negative self-statements – harsh judgments based on perfectionistic strivings, for example – and counter them in a process that could be called “reparenting the self.” An internal dialogue is developed, with the therapist’s help, that has a quality similar to what you might say to a good friend, or a child, when they are hurting and you are able to be supportive. Over time, this internalized “nurturing parent” develops further and provides the necessary support for your “wounded child” to heal, allowing for a much fuller and richer life. There are different forms of CBT and we would try to find a way that fits for you to incorporate CBT principles into your life. In effect, automatic and conditioned ways of thinking may lead us to narrow and distorted ways of understanding ourselves, others, and the situations in which we find ourselves. There is a loss of perspective. Rather than pathologize distortions in thinking, we see these as usual aspects of a stress reaction – when “buttons” are pressed and our brain’s processing power becomes more primitive. Psychology Today featured an article in 2013 entitled: “50 Common Cognitive Distortions.” We would highlight the word “common.” As they state in the article: “Becoming mindful of these common cognitive distortions will help you understand yourself and other people better, and improve your decision making.” CBT is an effective tool to help you do just that, not only helping you to identify when you may be distorting, but how to correct the distortions and clarify alternative, clearer perspectives and explanations, changing feelings in the process.